The new Apple iWatch will come in two sizes. Apple’s big media event is on September 9th, but the news is already leaking out on the new iWatch. Apple is planning to include short-range wireless technology (or NFC) in its upcoming smartwatch. This will focus heavily on the future of digital payments on mobile devices. This confirms what many had assumed about future Apple devices. But it also signals that Apple is looking to do more with its wearable than just health and fitness. Click here to learn more about wearable technology and the future. NFC will be present on the iPhone 6 too, allowing the two devices to communicate in a simplified manner. 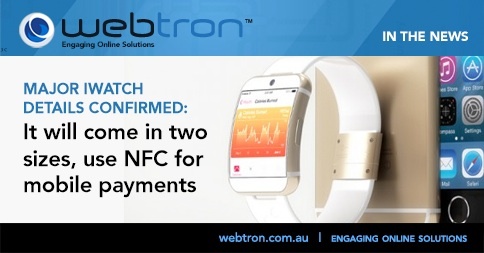 NFC will be key to the tap-to-pay initiative as well. This will allow users to pay for things with credit cards stored in their devices. Apples’s new smartwatch will apparently come in two sizes. Both will feature a curved OLED display and sensors to track health and fitness data. The source believes that Apple will unveil both the new iPhone models and the smartwatch last week, but as has been repeatedly affirmed by rumours and analysis, there’s no clear indication of when the wearable will be available to purchase. Although those familiar with Apple’s plans say the company was originally targeting a November release for the smartwatch, engineering issues have made a 2014 release unlikely. So you might not be able to get your hands on the iWatch this year, but the sources believe that Apple will let consumers preorder the device before it launches.